Vegans and meat-eaters alike will love this chickpea take on a lemon thyme egg salad. Check it out on the Pure Plate Plan blog. I had a blast creating and photographing this gluten free, dairy free paleo tropical bread. I share my secret to avoiding a dense sweet bread and getting fluffy results every time. Check it out over on the PaleoHacks blog. I’ve had the priveledge of developing the database of recipes for GeneFood’s customized nutrition plans. Their team of geneticists use raw data from genetic providers like 23andme and Ancestry.com to craft a custom nutrition report tailored to your genetics. Here is a sampling of the gluten free recipes I’ve developed for them, along with science-based nutrition discussions and custom photography. I’ve had the priveledge of developing the database of recipes for GeneFood’s customized nutrition plans. Their team of geneticists use raw data from genetic providers like 23andme and Ancestry.com to craft a custom nutrition report tailored to your genetics. Here is a sampling of the vegan recipes I’ve developed for them, along with science-based nutrition discussions and custom photography. 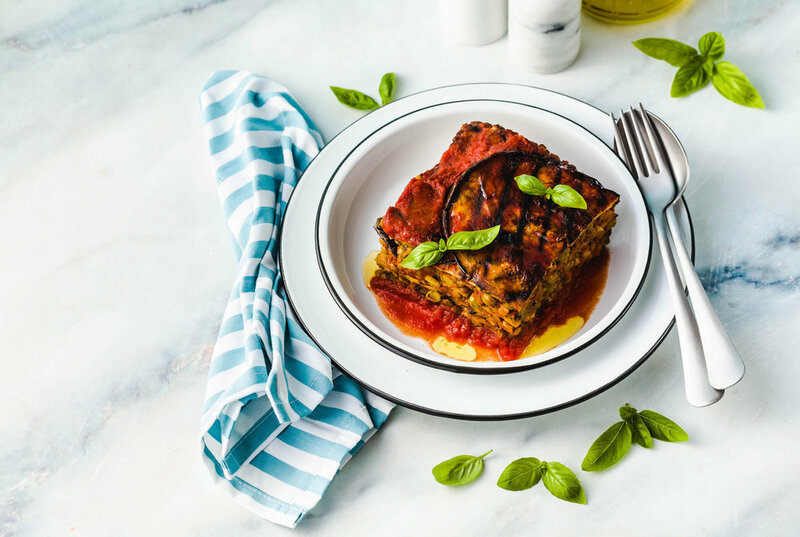 I developed this delicious Mediterranean-inspired vegan lasagna for Pure Plate. Get the recipe here. I had the privilege of ghost writing a blog about utilizing Raw Revelations’ incredible supplements to enhance mental health and wellbeing. These suggested treatments were developed at the guidance of Colin and Marilyn, the ever-knowledgable owners, and backed by scientific research. These gluten free and dairy free muffins are what dreams are made of. They’re fluffy and moist and topped with a delicious lavender glaze. The crispiest, tastiest, grain free waffles you’ve ever made. Vegan, gluten free & grain free. *These also work great as drop biscuits. Simply drop 1/4 cup of the dough onto the prepared baking sheet and bake the same amount of time. Cold is the name of the game - cold eggs, cold milk, cold butter. This keeps the butter from melting too fast and gets you that coveted flakiness. Don’t be too handsy - meaning, try to handle the dough as little as possible. Stir it until it is just combines and press it into a rectangle quickly. For me, the post-holiday meals are where things really get interesting. The holiday feast is over but the house full of guests remains, all with different schedules and preferences. Somehow you all still come together for meals. Our days after Christmas rise and fall with the meals we are eating and I live for those days of nothing to do but eat and lounge. I start planning our meals weeks ahead so I touch on everyone’s favorites. I prepare a dessert table that should be embarrassing calorie-wise, but the kids (and adults) eat it up. My niece loves to bake, so inevitably we add a few fresh baked goodies to an already full table. One of my favorite meals to plan is breakfast. We have kids of all ages, so the breakfast the 2 year old and his parents enjoy at 8am needs to be just as good as the breakfast the teens eat at noon. Or at least, some parts of it need to make it to noon. In walks these sweet & savory gluten-free scones. They’re great on their own, with a little honey or even in a savory breakfast sandwich (more bacon?). I love using date sugar in these because its less processed than granulated sugar and adds just the right amount of sweetness. The sweetness is built on by the addition of Verdant Kitchen Crystallized Ginger and the Caramelized Ginger Syrup coating on the bacon. Cold is the name of the game - cold eggs, cold milk, cold butter. This keeps the butter from melting too fast resulting in the coveted flakiness. Don’t be too handsy - meaning, try to handle the dough as little as possible. Stir it until it is just combines, press it into a circle quickly and use a sharp knife to cut the triangles. A dull knife will smoosh instead of slice and the edges won’t fluff as much. These scones can be made ahead of time, or if you’re going for that fresh-from-the-oven vibe, you can make the bacon ahead time and get yourself halfway there. The recipe below makes more bacon than you need for the scones, so there will be a few snacking pieces, but you probably wouldn’t be mad if you made double the bacon to have more on the side. Grab your ginger goodies from Verdant Kitchen and remember to use the code GINGERBELLS15 to get 15% off your entire cart! 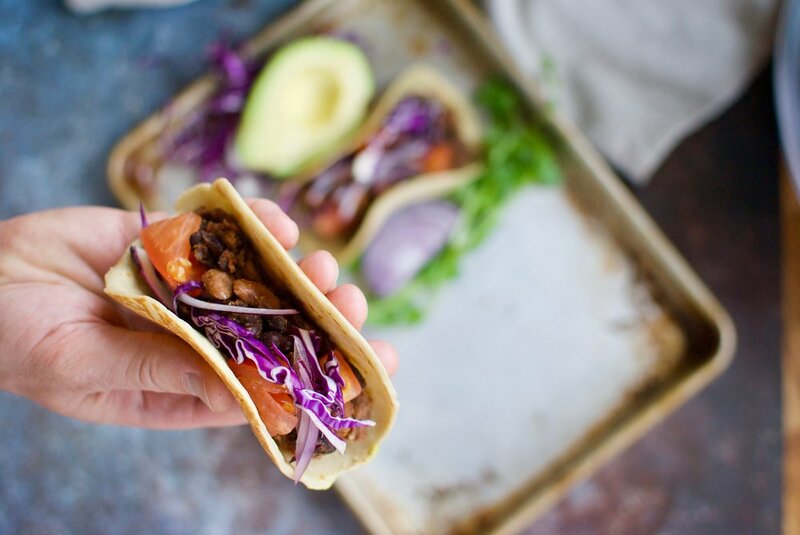 Not only is this recipe super delicious, but it reduces waste by using parts of the veggies we usually discard. By using the carrot tops and delicata seeds in the pesto, we’re cutting down on what we toss while adding a ton of delicious flavor. You’ll love the sweetness of white balsamic & Verdant Kitchen’s candied pecans paired with the savory carrot tops, garlic & onion in the pesto. I always make a double batch (at least) and freeze some in ice cubes trays for future meal prep. 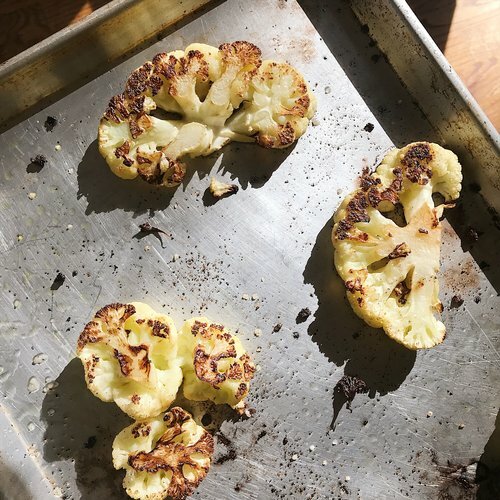 This recipe is the perfect way to showcase the beautiful veggies winter brings us. I made it with carrots & delicata squash this time, but you can use any winter squash or root veggies! Make it your own and don’t forget to use the code GINGERBELLS15 to get 15% off your entire cart at Verdant Kitchen. Did you make this recipe? Tag me on instagram at @sundaybacon to be featured! Ready to wow your guests at your holiday feast? Look no further than this easy and beautiful recipe featuring USA grown ginger preserves and ginger syrup from Verdant Kitchen. Use the code GINGERBELLS15 to get 15% off your entire order. Over the years, my Linzer cookie recipe has evolved from classic to vegan to gluten-free, but this year’s recipe tops them all. This gluten-free, ginger-packed version of the classic Linzer cookie is easy to make and features my favorite ginger-loving company, Verdant Kitchen. We’ve teamed up to give you 15% your entire purchase when you use the code GINGERBELLS15 at checkout. Hop over to my Instagram @sundaybacon to enter a chance to win some ginger-ful goodies for you and a friend! And remember to tag @sundaybacon, @verdantkitchen and #gingerbells with your creations! Happy baking! Lay whole cookies (the one’s without the peek-a-boo window) out and set 1 tsp Verdant Kitchen Ginger Preserves with Lemon in the center of each then top with a peek-a-boo cookie and place a piece of Verdant Kitchen Crystallized Ginger in the middle. Roast 20 minutes, carefully flipping halfway through. This Ginger Cranberry Apple Bake is the start to a beautiful relationship with my new spiralizer attachment for the Kitchenaid Stand Mixer. It was inspired by an Epicurious recipe and adapted to be gluten free & vegan. I love this one for a big group because it can be prepped ahead, looks impressive but is ready in no time.